I want you to think about this and think deeply. Will any human being still be alive on this planet Earth in another five or ten years? Our greatest problem right now is the problem of human survival. Are you still going to be alive, your children — five or ten years from now? I visit and talk with heads of governments, all heads of nations all over the world; presidents, prime ministers, kings. I talk to them about their problems; and their problems are greater than they can solve. I've talked with some of the great minds of this world; and they can't understand, they can't solve these problems. We've had our Einsteins, our Edisons, our great thinkers and they seem to be helpless before the problems that humanity is facing on this earth. We are making great progress, in a way. We are having absolutely fantastic progress; at the same time we are having appalling evils that are threatening to destroy us all. Why is this kind of thing? If the human mind can produce the automobile, the airplane, spacecraft that can send men to the moon and back safely, and can produce the hydrogen bomb that can annihilate all human beings off the face of this planet and destroy us all — why can't the human mind solve its problems? In all human learning and knowledge production that is disseminated in the colleges and the universities of the world they have never yet learned the secret of the human mind. They have never learned the secret of the human mind — what is it? Psychologists don't know of what the human mind is composed. They don't understand and the whole world is in trouble. It is not immortal. And God Himself said of the first man, as you read back in the first chapter of the book of Genesis; that if he took the forbidden fruit, he would surely die. And he did die — he lived 930 years and then he died, because he did disobey and take the forbidden fruit. He wouldn't come to even know and have the knowledge that a human can have, except by the spirit of man that is in him. Now let me explain that. A human brain is precisely like an animal brain. I have a booklet just coming off the press now: 'What Science Can't Discover About the Human Mind' On the front cover is a picture of a man and his brain just beside him, a picture of a chimpanzee brain, a picture of an elephant brain and also of a dolphin brain. 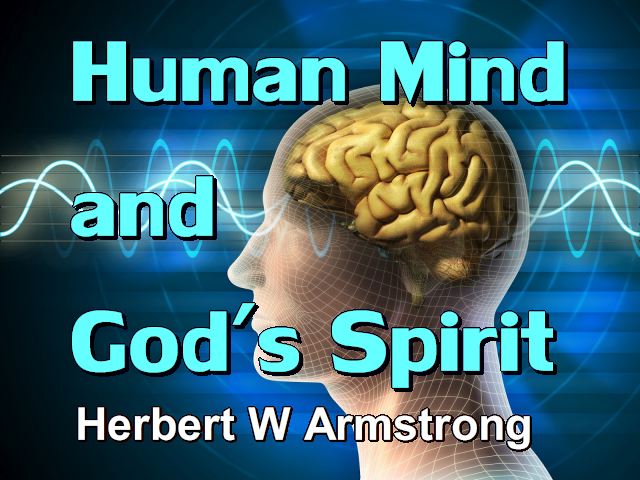 This is a booklet about the human mind and explaining something that you have never known about the human mind and what scientists cannot discover and do not know about the human mind and why it can't solve our problems. The spirit in man gives man a knowledge. A power of knowing, and a power of intellect, and a power of decision making, a power of will, of attitude; that the dumb animals simply do not have. What is the difference? And yet the brain is precisely the same. And they are revealed through the Spirit of God, and he cannot know those things. That's why the world is in such trouble today — that's why they are in trouble. This book, the Bible, is the word of the Living God; it is the book of the Living God, in which God speaks to mankind. But it's God's secret code and you can't break that code and understand it without the Spirit of God. And most people — hardly any of the people you might say, on the earth today have that spirit; that will unlock their minds to comprehend and unlock this code so you can comprehend it and understand it. Because it just seems like so much foolishness. Here is a book that is not taught in the colleges and universities. Go down to the Library of Congress and notice the hundreds of thousands and even millions of volumes of books written by men. And all of those books can't give you the knowledge, or the learning, to solve our problems on this earth. Here is a book that can! Look at the books they use in science and in teaching in the universities in this world. And a university has been called a knowledge factory, a factory of knowledge production. But they can't produce the knowledge to solve our problems and bring us out of our troubles. This book could, but this seems to be foolishness to them, because you can't decipher it without the Spirit of God. Same words all over again, identically the same thing again. In other words, you are an immortal soul. And people have been believing that lie ever since. Satan the devil was; "...a liar, and the father of it." (John 8:44) as Jesus said later. And people have believed that lie and have not believed God. Constrains me, that is, suggests things to me and sort of leads me in a way. The spirit — it has something to do with the brain. It is very closely associated with the brain. Adam was incomplete. God had told Adam to be fruitful, multiply and replenish the earth, but a man can't reproduce by himself. He was incomplete, he was not all there. So God formed a woman and presented the woman to him and now he became complete and they became one. One family, as God is one God, one family. Now likewise, the human mind is incomplete as God created it, but God meant to have it created with our help. But that's where we have our own part in it. We have to submit to receive the completion of the mind. And what we need is another spirit, the Spirit of God. And man has one spirit that gives man the knowledge of dealing with matter, with things. He can deal with people, but he doesn't know how to deal with them properly; and he gets in trouble. And he has no right relationship with God without the Spirit of God. And he cannot have peace without the Spirit of God. He can't have the knowledge of the way to peace without the Spirit of God. In other words his mind is only half there. What is the human mind? The human mind then is brain plus human spirit. Now everyone has a human spirit that is born in him. That spirit is essence. It is not a being, it is not a person; it's just spirit essence like air or water. But there is a portion of that spirit in every being. And that spirit empowers the mind to think. To acquire knowledge of matter, and to deal with material objects and material things. It also gives him a sense of either love or hate. And he doesn't know how to control that and direct it in the right channel. And he is directing it in the wrong channels. And man has chosen the way of self centeredness as he was influenced by Satan the devil. And that's not very popular to believe either, but it's true and that has happened. And this book which is foolishness to the highly educated explains all of it and you can't understand the problems in the world and what has happened if you don't understand the basic simple plain knowledge of this book, the Holy Bible. So the human mind was made incomplete with the one spirit that needs another spirit with us. Now the first man was offered that other spirit, the Spirit of God. That was in the tree of life, eternal life. Now the tree he did take of, the tree of the knowledge of good and evil, but it was going to result in death, it was the tree of death. The tree of life was just opposite. It also was a tree of knowledge; it was the tree of the Holy Spirit that would reveal the knowledge of God. A man can't know those things, as I was just reading to you over in I Corinthians 2 a while ago. But God reveals them through the Spirit; the Spirit changes your mind to comprehend and to understand spiritual knowledge when it is revealed by God, or by Christ, or through the Bible, which is the word of God. And Christ is the living Word of God and the Bible is the same word of God in writing. Now, this spirit of God was offered to Adam in the tree of life, which he could freely have taken, but he did not take it. And so God closed it up, until Christ should come. It is offered today to those whom God calls through Christ. Through Jesus Christ, who is the second Adam. Adam chose the self spirit, the human spirit, that was already created within him. It is born within every baby who is born, that human spirit. But with that human spirit alone, human beings have been utterly unable, utterly helpless to solve their problems. And this world is full of problems. And this world — now man has been dealing with matter. He has the ability to acquire knowledge to deal with material things. And all of the progress, all of the accomplishments that we have in this world have been in the material area. We accomplish very great things with matter, but we can't get along with one another. And all of our troubles are in getting along with one another and the fact that man has no contact with his Maker — the Eternal God. That is, most men do not; and even those few who think they do, do not comprehend and do not understand. There is so much of it that they don't understand. Now Jesus brought the solution. A lot of that is given on the day of Pentecost back here in the Book of Acts. When the Church first started — the very day that the Church first started, about a little over 1951 years ago. It's in the second chapter of the book of Acts, verse 38. Peter had preached quite a sermon and very many people were there. There were more than three thousand there and they asked Peter and the other apostles what they should do about things; they had crucified Christ, or they had been consenting to it, and things were not right in the world. God has given us the spirit of a sound mind. And not a wacky mind, not a wrong kind of a mind. And we have too many of those in the world today. Not of a mind of foolishness, but a mind of sound thinking and understanding and comprehension. I've only had time to give you just a little bit of this, about the human mind and how different it is from animal brain. And yet animal brain is just like human brain and just as good. I would like to offer you this new booklet — just coming off the press; 'What Science Can't Discover About the Human Mind'. It is not taught in any university, it is not preached in any church, it is not known by man generally; it's in this book! Read it with your own eyes in your own Bible at home and get this book. There are some beautiful pictures of different brains on the front cover, of man and different animals. So until next time, this is Herbert W Armstrong, good bye friends.